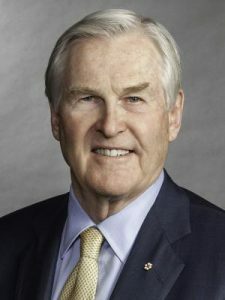 In Memoriam: It is with profound sadness we observe the passing of Michael Wilson, former finance minister of Canada. Mr. Wilson served Canada devotedly throughout his career; he held multiple cabinet positions, under several prime ministers, including Minister of International Trade, Minister of Industry, Science and Technology, and Minister of Finance. Most recently he acted as Canadian ambassador to the United States from 2006 to 2009. During his time in the private sector, he ably led the business community, occupying senior roles at UBS Canada, Royal Bank of Canada and chairman of Barclays Capital Canada. His work in the investment industry was recognized by an induction into the IIAC Hall of Fame in 2014. Outside his professional public service, Mr. Wilson gave back to the community in myriad ways, including as a strong advocate for mental health issues — which included serving as the chair of the Mental Health Commission of Canada for the past four years – and as Chancellor at the University of Toronto from 2012 to 2018. The IIAC wishes to express their deepest condolences to the family of Mr. Wilson. He was a pillar of Canadian public service, a renowned intellect, and a true gentleman. He will be deeply missed.